The Miami clubhouse fell silent. After finding out they wouldn’t be making the postseason for the first time in 45 years, the Hurricanes were dejected. It was like a bad dream. But this year, the Canes are poised to start a new run. Despite suffering an off year, Miami still has its sights set high. The College World Series is in June in Omaha, Nebraska. And if the Hurricanes needed any extra motivation, the 2018 campaign will be the 25th and final season for Morris. Miami garnered multiple preseason top 25 rankings, including a No. 9 ranking by Perfect Game USA. Bargfeldt said the team has a strong combination of new players and veterans, who have experienced both success and failure. “We’re a type of team that can beat you in a number of different ways, if we play to our full potential,” he said. The Hurricanes return 2017 team MVP Romy Gonzalez, who finished with a team-high 11 home runs and 38 RBI. Bargfeldt, who was an All-ACC second team honoree, had a 7-3 record as a starter with a 2.28 ERA. Junior reliever Andrew Cabezas recorded a 2.15 ERA with 80 strikeouts in 62.2 innings pitched. 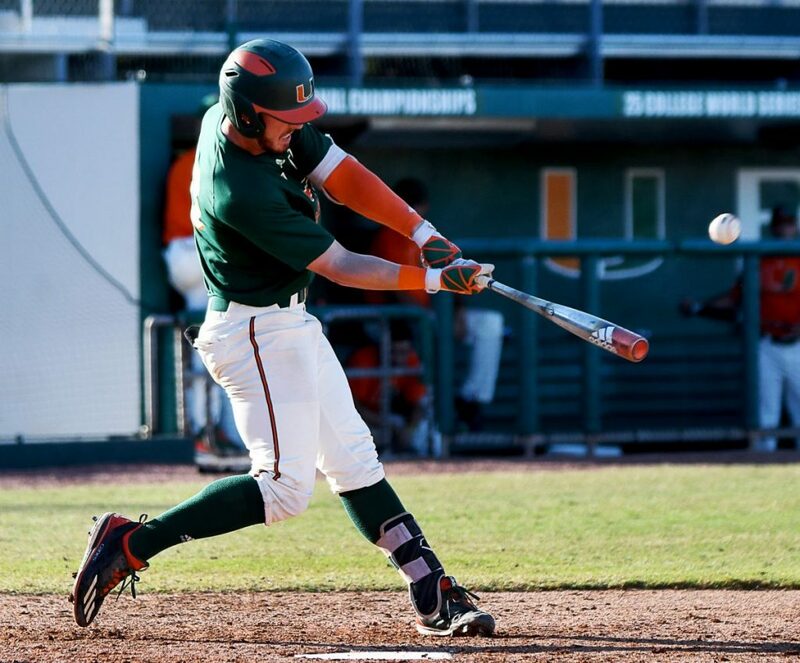 Miami also brings back hard-throwing, right-handed sophomore Gregory Veliz, redshirt senior outfielder Michael Burns and junior reliever Frankie Bartow. UM adds a recruiting class ranked No. 8 by Baseball America, headlined by right-handed starting pitcher Christopher McMahon and infielders Raymond Gil and Alex Toral. McMahon, who is hopeful to return by late March after undergoing offseason knee surgery to repair a torn meniscus, was picked by the Atlanta Braves in the 33rd round of the 2017 MLB Draft, while Gil was selected in the 37th round by the Oakland Athletics. Toral, who was ranked No. 199 according to Baseball America’s top 500 draft-eligible prospects, went undrafted. Although the lineup might feature young players, the Canes starting rotation should remain intact from a year ago. Bargfeldt, Veliz and Evan McKendry will most likely headline the weekend, while Michael Mediavilla should get the first crack during the week. Miami kicks off its season with a three-game series against Rutgers at 7 p.m. Feb. 16 at Mark Light Field.